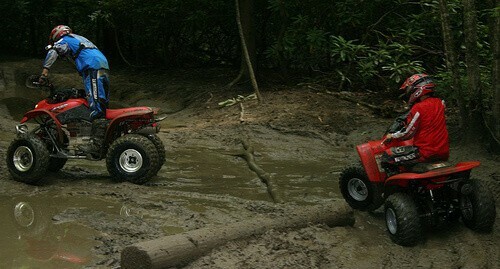 ATV’s are a fun activity for all members of the family, including the kids. With an ATV, kids are able to gain confidence while they have a great deal of fun. It’s also a great opportunity for parents to bond with their kids while keeping them healthy and active outdoors. Taking a day to explore the great outdoors, especially by traveling off the main roads to really see what great things nature holds, is not only a fun thing for families to do, but it’s also a great way to start instilling a sense of responsibility in children. Do You Have a Perceptive Child? Riding an ATV takes fast thinking and being able to have good perception when it comes to riding in various types of terrain. You will want to ask yourself if your child would be able to figure out what to do if the weather suddenly changes while riding or if the terrain becomes steep or unsteady. In most situations, if your child rides a bicycle on their own, plays sports or can be extremely active without any problems, they are most likely going to be alright riding an ATV as well. If your child is still in the stage where they believe they can jump from the tallest tree in the backyard and land like Superman, they are probably too young for an ATV. Be patient however because you can use these younger years to start developing a good sense of judgment and coordination that they will need when they are ready to begin riding. Can They Reach the Controls? When you decide that your child is old enough to have their first ATV, you will want to have them sit on several to see which one they will be able to ride the best. In other words, make sure they can easily reach the controls with their arms, turn the handlebars completely in both directions and that they can handle the brakes, throttle and all other controls with ease. You also need to make sure they have at least 3-4 inches of open space between their body and the seat when they stand up on the footrest. While standing on the footrest they will also need to be able to control the ATV with their hands, see clearly over the front and stay balanced comfortably. Safe riding begins with what you, the parent, teach your child. When you buy a new ATV, be sure to sit down and read the owner’s manual with the child and never let them ride at all until they can demonstrate that they fully understand the instructions that are set in the manual. Once they can demonstrate this verbally then you should move on physical demonstrations by allowing them to practice a little at a time until they get the hang of riding. Your child may have ridden for several years on the back of your ATV, but unleashing them to ride their own can be a very different story altogether. No matter how great you may feel about their riding skills, you need to make sure they are supervised during each ride, especially when they are young riders. Scheduling a rider safety course with the ATV Safety Institute (ASI) if available in your area is a great idea to help teach your child in-depth safety information as well as how to ride the right way. In many states, classes are offered for free when a person purchases a new ATV. If you choose not to schedule the course or one is not available in your area, you can always check with the ASI website for great info about rider safety for children as well as adults. If you have a child that is older than the recommended age for a larger engine size and has never ridden before or one that you feel is not yet strong enough to handle a larger engine size, you can always purchase a smaller ATV until the child has mastered riding and you feel confident that they will be alright with a larger one. Once you have decided on the right ATV for your child, you will need to get it home so they can enjoy it. Many people purchase ATV’s with local dealers and can load them up on a trailer and haul them home on their own. A good deal of people will order their ATV online and will need to have it shipped to their home since the seller is not local. To have the ATV shipped to your home you need to hire a quality transporter to handle everything for you. A company like A1Auto Transport, Inc. will be able to get you a great price for having your new ATV transported across the miles safely. Once it arrives, your child will be able to start riding and making memories that will last a lifetime. You may also want to make sure your child has the appropriate riding gear before they get on their new ATV. Riding gear, including a quality youth helmet, should be worn every time your child gets on their ATV. They also need long sleeves, riding gloves and a good pair of riding boots. Teaching your child safe riding habits when they are young will help instill a lifetime of safe habits that will stay with them as they get older.